Exfoliating is vital in removing the dead skin debris and dirt from atmospheric pollutants that dulls the complexion and Dermalogica daily microfoliant is about the best there is in my opinion. An opinion that is shared by twenty three out of the thirty one people who have left their review of the product on Amazon.com who give it a five star rating (at the time of writing). Dermalogica daily microfoliant is a natural, rice based micro-powder that contains absolutely no artificial fragrances or colours. It is brilliant whatever skin type you have – although it is recommended that you do not use the product if you are already using a prescription exfoliant for a skin condition. The product is an enzyme powder which leaves your skin feeling wonderfully smooth and soft and brightens your complexion noticeably after just one application. The product is supplied in a 2.6 ounce size and lasts for ages as all you need for a treatment is about half a teaspoon of the powder which you dispense into wet hands and rub your hands together so that the product forms a smooth and creamy paste. You apply it to your face using gentle, circular motions with your fingertips, paying particular attention to any problem areas – especially if you are using it as part of your blackhead removal treatment regime. Avoid the delicate eye area and do not get the product into your eyes. Keep massaging gently for about a minute and then rinse off thoroughly – that’s all there is to it! The product is activated by contact with the water in your hands. Rice enzymes, Papain and Salicyclic Acid get to work exfoliating your skin straight away. Papain comes from unripe Papaya fruits and is proven to exfoliate the skin more gently than standard glycolic acid treatments so it is much less likely to cause any irritation. The brightening action on the skin is achieved through the combination of Grapefruit, Licorice and Aspergillus which helps to even out skin pigments. To ensure your skin is left feeling clean, clear and soothed after treatment, the microfoliant also contains a blend of Ginkgo, Colloidal Oatmeal (well-known for its beneficial effects on the skin) and antioxidant-rich green tea. 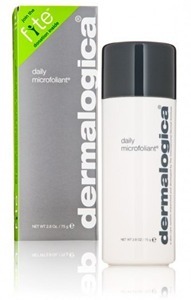 Get Dermalogica Daily Microfoliant from Amazon if you live in the UK, this link will take you to the product page there Dermalogica Daily Microfoliant – 75ml/2.5oz . After your daily micro-exfoliation with this Dermalogica Daily Microfoliant, you can use a toner and moisturizer of your choice for your own skin-type.